First, you have the idea. It meets a need, solves a problem and people are going to pay boatloads to have your product or service. Elation! But the feeling fades a bit as logistics creep in. How do I get started? And how do I to TELL people about this? Building a website is likely on the first checklist you’ll make. But (unless you’re as nerdy as we are) you likely have no idea where to start – which is totally ok. Your business idea probably doesn’t involve building websites, so your expertise lies elsewhere. Simply put: you should love pulling it up, and you should never feel like you need to apologize for it. While there are a number of necessary headaches that come with running a business (see: taxes, cranky customers, tracking mileage…), there’s no reason your website should be one of them. All it really takes is putting together a plan and setting aside time to either educate yourself enough to do the work or finding a great web partner to craft a beautiful web presence for you. If you’ve built a great brand already, but just haven’t had time to make sure that it’s represented well on the web, you’re just a couple quick steps from fixing that. If you’ve never quite spent the time to develop a strong brand image (the colors, the logo, the fonts, the consistent imagery), send us a note. We’d love to share our favorite resources with you as well as how much we loved walking through this process for our business. Having a website you love to visit (and send clients to) is a great goal for 2018! Have you ever thought about how many times a website has been your first impression of a business or organization? It probably happens more frequently than you realize! Any time we’re on the hunt for information, it usually takes us straight to the internet by way of a search engine. And once you’re there, it’s like walking into a (virtual) shopping mall with a bunch of similar businesses. Even if you aren’t selling anything online, what do clients think of your “virtual storefront”? Are they intrigued? Do they want to come in and look around, or do they want to move on to the next candidate? 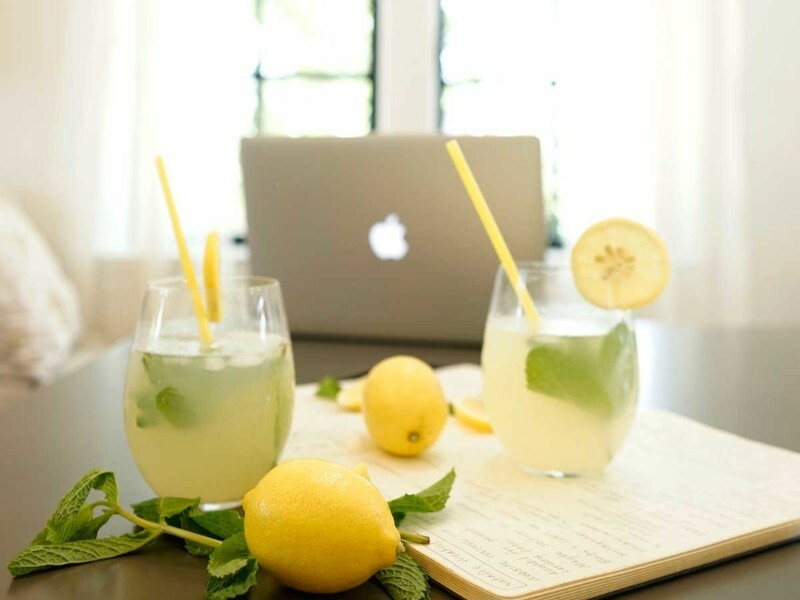 DigitaLemonade really believes with all our hearts that technology doesn’t have to be a headache. For us, seeing someone get to stop feeling guilty or embarrassed about their website and start feeling excited about it creates an instant high. Make a plan to start your year by investing some time in transforming your greatest eyesore to your greatest 24/7 sales team. Do you remember the last time you pulled up a website where the footer boasted “Copyright 2002”? It may have been a solid site when it was launched, but since that time there have probably been some obstacles. Since small business are… well, small… you are likely managing job responsibilities that might be divided among 20 different people in a larger organization. This can be an exhilarating challenge (we kinda love it), but it also means that you rarely wake up and spontaneously think about doing something that isn’t either (a) on your calendar or (b) urgent. So, without some intervention, your website will live on its original ten-years-ago state. Fortunately, it’s not that difficult to ensure your website walks into the new year (and the next 16 new years) with you. The beginning of the year (or the day you roll out your new website) is a great time to sit down and create some calendar events. Set your calendar reminders to review and update your website – otherwise, it’s probably not happening. Every business and organization website will need a slightly different amount of care and feeding during its lifetime, but we recommend reviewing site content at least once a quarter. In addition to triggering regular review reminders, you’ll want to make sure you have a system in place to knock out those changes without a huge headache. If you’re a DIY-er (or if you’re just starting out and your budget is a little tight), spend a few minutes on YouTube. Search for any admin tasks that drive you crazy, and get them figured out. The next time you’re faced with updates, they won’t feel as intimidating. If you feel like adding one more thing to your to-do list or YouTube-ing might just send you over the edge, that’s ok! Mentally erase the last paragraph, and spend your time finding a great website partner. You’ll want someone you can communicate with easily, who takes the time to understand your business needs, and who (of course) knows how to slice and dice your website in all the ways needed. Does your website check these three boxes? If it doesn’t, invest time in changing that. Create something that makes you love your brand more, something that’s a great first impression for future clients, and something that isn’t intimidating to update. Soon, your website will be a bright spot and you can spend your energy running your business and getting to know the clients it brings in.